Image centre is located at 00:00:45.2, -60:55:12 (H:M:S, D:M:S, J2000) Astrometric data from Astrometry.net. This part of the sky was mostly uncharted by Europeans until the 17th and 18th centuries, so many of the constellations in the southern (lower) half of the image are relatively modern constructions without mythlogical connotations. Many are also quite insignificant, and the more or less complete constellations visible are listed above. The bright, Milky Way constellations of Centaurus, Circinus, Crux (with Musca), Carina, Puppis, Triangulum Australae, Vela and Volans have their own pages. A wider, landscape-format version of this is available and it includes all of Carina and most of Pictor. Wider still is the image that includes the obsolete constellation of Argo Navis. Octans, the Octant (a forerunner of the sextant) is an Enlightenment-period instrument whose outline was constructed on the sky by the vivid imagination of the Abbé Lacaille. The constellation is quite large but totally undistinguished. Its only notable feature is the South Celestial Pole, with is marked (within a degree or so) by the faint star σ Octantis, and is identified above. Apus, the Bird of Paradise, first appeared in the star charts of the German astronomer Johann Bayer in 1603. It contains no named stars. Mensa, the constellation was invented by de Lacaille to commemorate his sojourn at the Cape of Good Hope in the 1750s. The original name was Mons Mensa, Latin for Table Mountain. 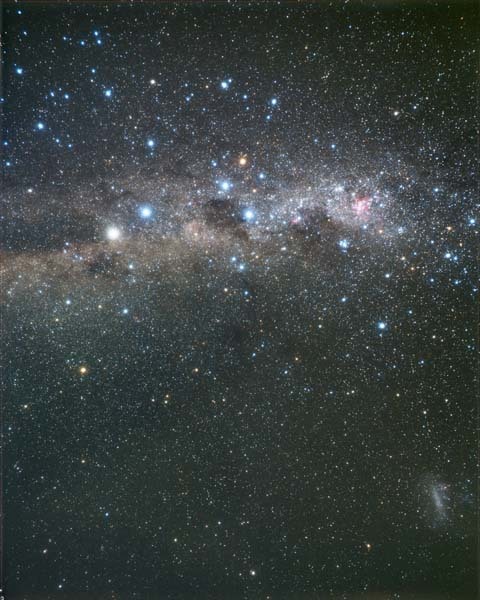 Its northern border crosses part of the Large Magellanic Cloud, possibly reminding Lacaille of the recurrent cloud over the mountain as seen from Cape Town.